Win a Pair of TheraSpecs or a Coaching Session With Kerrie! 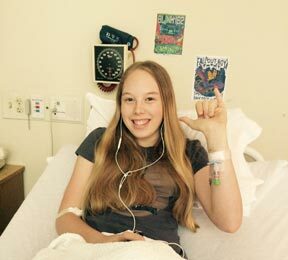 The 30 Things meme is all about raising awareness of migraine and headache disorders… and you can win a prize, too!. Answer 30 questions about what it’s like to live with migraine or a headache disorder and submit your answers in the form at the end of the questions. By submitting your answers, you’ll be entered to win a 30-minute phone or Skype coaching session with me or your choice of any pair of indoor TheraSpecs. Your responses will be given a URL, which you can share to raise awareness. 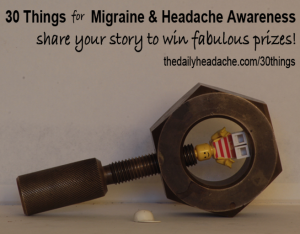 You’ll get an extra entry each time you share your 30 Things on Facebook or Twitter and tag The Daily Headache or @tdhblog (be sure to tag The Daily Headache so I see your entry!). To be entered, simply submit your responses to the 30 Things meme by midnight June 29 (Pacific time). For extra entries, share your URL on Facebook or Twitter as many times as you wish before midnight June 29 (don’t forget to tag The Daily Headache or @tdhblog). On June 30, I will announce a randomly select a winner. To preserve anonymity of those who prefer it, I will only announce the winning entry, not the winner’s name. Rules summary: Giveaway valid in the US and Canada only, except Quebec. (Sorry, the variation in local laws makes it too difficult to do elsewhere!) No purchase necessary. Winner will be randomly selected from all entries. Entries can be made through the 30 Things meme on The Daily Headache and sharing your answers on Facebook or Twitter (be sure to tag The Daily Headache so I see that you shared!). You can also enter by emailing kerrie[at]thedailyheadache[dot]com with the subject “Giveaway Entry.” Entries will be accepted from June 1 through midnight on June 29, Pacific time. The winning entry will be announced on June 30 on The Daily Headache, Facebook, and Twitter. The winner will have until midnight on July 3 to contact me to claim the prize. If the winner does not contact me, I will draw another winner. Email kerrie[at]thedailyheadache[dot]com for complete giveaway rules.